Photographer and architecture graduate Lisa Cassidy spots the “beautiful, interesting, important or strange” in Dublin’s buildings and public spaces. WHEN YOU’RE WALKING around Dublin, do you ever look up and spot an unexpectedly decorative panel or an old shop sign, writing faded but still giving a hint to a building’s former use? Architecture graduate Lisa Cassidy has made it her business to notice the hidden architectural gems in the capital city or as she puts it on her site, BuiltDublin.com, “the things that are beautiful, interesting important or strange in Dublin’s built environment”. Cassidy photographs her discoveries and posts them on the site for everyone to enjoy and share. Cassidy grew up in Dundrum but spent a lot of time in Rathmines with her grandparents as a child where they would point out little quirks and Victorian touches on the red-brick buildings that typify the Dublin 6 enclave. Dublin is an easy city to walk around because of its size, says Cassidy, “and it is very safe and heavily used”. She was at a talk recently where someone mentioned that there should be a way to reclaim areas that are beautifully designed and executed, like the Liffey Boardwalk, but the way it is then used after completion is not what had been envisaged. The speaker said that “it is our responsibility to start using it” and reclaim it bit-by-bit from anti-social behaviour. “Since I heard that, I have been using the boardwalk a lot more – and I love it there,” says Cassidy. Here are some of the buildings and architectural details that Cassidy features on her site. Go to BuiltDublin.com to see and read more. (All images and words in the slideshow are kindly supplied by Lisa Cassidy). This is a little brick kiosk at the junction of Adelaide Road and Leeson Street. 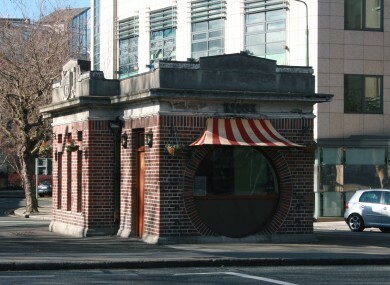 It was designed by Michael Moynihan (who also did the public toilets at St. Stephen’s Green) in 1929 as a water pressure station, public toilets and kiosk, and it’s currently home to a small cafe. The masonry (brickwork) is good, well-maintained and has visual interest like the 45º chevron pattern on parts of the two long elevations (or sides). The parapet – the stone extension of the wall that continues above the roof – has the city’s coat of arms displayed on it. Built for such a utilitarian purpose, the building itself is jaunty and pleasing to look at even without the striped cafe awnings and hanging baskets. The most beautiful part of Dublin Airport happens to be its best-kept secret. It’s somewhat hidden, tucked behind the Terminal 1 car park in the airport’s current configuration, but once you get inside the open-air atrium in front of the church, you’re as far removed from duty-free shopping and incoherently loud passenger announcements as could be. The Iveagh Buildings were developed by Edward Cecil Guinness, the first Earl of Iveagh, to provide housing and amenities for the city’s working poor. Edward was a great-grandson of Arthur Guinness, founder of the brewery and namesake of a bizarrely all-consuming annual advertising campaign, and his philanthropy in Dublin and London was intended for the public good. Dublin’s tenements were notoriously overcrowded and unsanitary at the beginning of the 20th century. Today, the Iveagh Trust is still active in Dublin as a charity focused on housing, as well as running a homeless hostel. Sitting on the seafront by a major junction in Clontarf, the utility building is a curious, closed object. It was designed by De Paor Architects and completed in 2003, part of a programme of works by Dublin City Council and the Royal Institute of the Architects of Ireland to rationalise and densify Clontarf village. The building provides a new home for the dilapidated pumping station that had been on the site, and also accommodates an electrical substation and a store for the Parks Department. According to the architect, the angular form of the building is expressing each of these three hidden functions – I’m not sure about that, but it’s certainly beautiful and dramatic as well as functional. Tucked by the side of the lake on the approach to O’Reilly Hall, the extension to the Virus Reference Laboratory is on a tight site between the existing Laboratory and the 19th century Ardmore House on UCD’s main campus at Belfield. It’s one of the good contemporary additions to the campus, completed in 2003 by McCullough Mulvin Architects. From the lake, it’s slightly elevated and perching like a pavilion on a small slope with steps leading up to the entrance, where a timber-clad arm reaches back to make a corridor to the existing building and shields a Japanese-style garden from view. These two shopfronts are in a terrace of fairly ordinary, small, local shops on Errigal Road near the junction with Drimnagh Road. CONROY is a butcher’s, with its small cursive sign on a darker patch of tiles in the larger blue-with-a-bit-of-brown scheme, nearly aligned with the shop window below. K. DOYLE is a greengrocer’s, with its lettering set on a mint green band over the lower black tiles. Though both are eye-catching, it would be hard to beat the crispness of the mint/black grid. Yum. This is one of the most lovely shopfronts in Dublin, but if you’re not in the market for bibles or related gifts, it might not be a place you’ve stopped to admire the windows. 41 Dawson Street is home to the National Bible Society of Ireland and their bookshop, Bestseller. G.P. Beater made alterations to the building in the 1920s for the Hibernian Bible Society, so the tenants have a long history with the building. The two central panes of the window curve inwards to make a recessed entrance, where there’s a mosaic monogram for the Society set into the paving like a welcome mat. ‘Bible House’ is carved into the door’s surround, naming the building, and it’s one of the little details I’d missed before I stopped right outside. Up above the entrance, there’s stained glass with an art nouveau influence to it, throwing colour down on the window display when the sun shines through. These flat blocks by Dublin Corporation (now Dublin City Council) were a standard design which can be seen all around the city – the distinctive roof profile is a giveaway, as is the attached stair core with its round plan and lozenge-shaped windows. A few have abstract mosaic patterns on the balcony, but the ones at Lower Kevin Street and North William Street have extraordinary images like pixel portraits. Geometric pattern on the undercroft of Wilton Park House, just off the canal near Baggot Street. The building was completed in 1984 (after a complicated history), by Tyndall Hogan Hurley, and it’s quite sober and serious, clad in granite and stainless steel panels…until the burst of colour hidden above the entrances comes into view. Huge, tentacular hinges on a mews access door on Upper Lad Lane. They’re ridiculous and must make opening the door a delight every time. Wynnefield Road is kind of a surprise. It’s just off the junction between Rathmines Road and Castlewood Avenue, near the post office, Tesco and Swan Centre, but as it’s at a slight angle to Rathmines Road, it can look like little more than the side of Slattery’s pub and then nothing. I’m a big fan of Slattery’s from any side, but the street also offers a small row of shops including good Lebanese and Palestinian food, as well as the decorated chimney of the former Trustee Savings Bank on the corner. Above the roofline of the shops, there are a series of gabled dormer windows with timber fronts. In various states of disrepair and weathering, they run through a spectrum of greens, from a yellowy sap green to nearly blue. Like a precursor to WordArt, the sign on the gable of The Hill pub in Ranelagh mimics the pitch of the roof. Email “The hidden gems of Dublin architecture”. Feedback on “The hidden gems of Dublin architecture”.